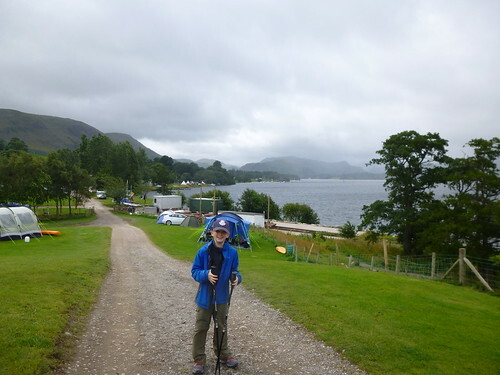 The second day was purposely be a relatively short day as I was very conscious of the fact that this was my nephew’s first trail, and with a relatively hard day behind him, he might be feeling a bit worn out on day 2. 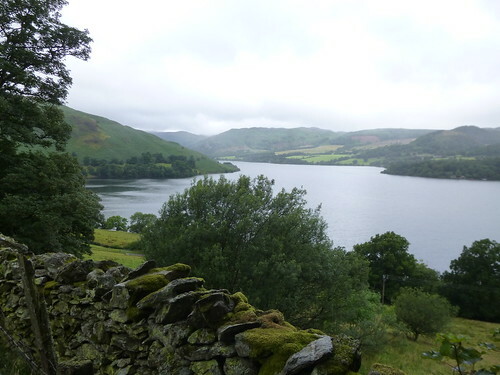 Realistically, though, had we gone past Pooley Bridge it would have made for an exceeding long day. As it was, this walk would prove to be enough. We left the hostel under a pretty grey sky to an initial chorus of “why can’t we take the car down?”, which quickly dissipated as we set off. (You’re on a walking holiday pal, we don’t use the car! (is that too unsympathetic?)). There was a convenient shop in Glenridding where we stocked up on some very nice local produce for lunch. It was a mile or so down to the pier, give or take, but we left plenty of time to catch the boat to Howtown. 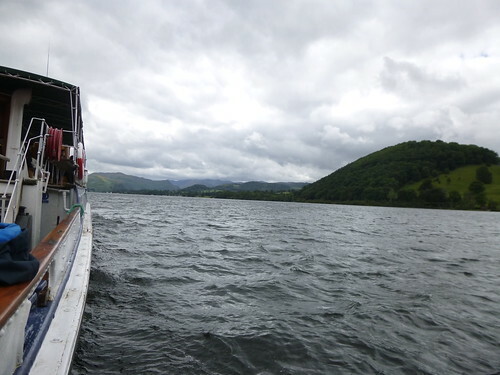 Once on the boat we settled down to enjoy the ride, getting a unique 360 degree view of the hills surrounding Ullswater. It wasn’t the warmest on deck, nothing that couldn’t be sorted with a fleece, although the odd spot of rain did threaten – it may just have been a bit of spray off the water. 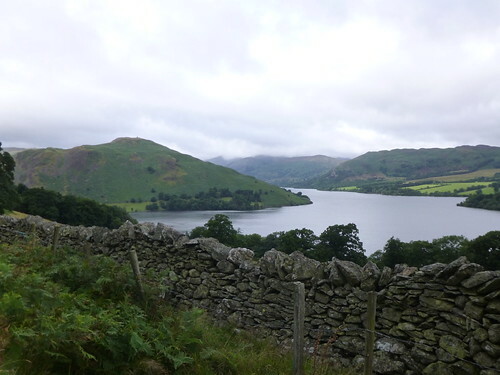 There were plenty of walkers out on the track already, a steady stream heading in both directions between Howtown and Patterdale. 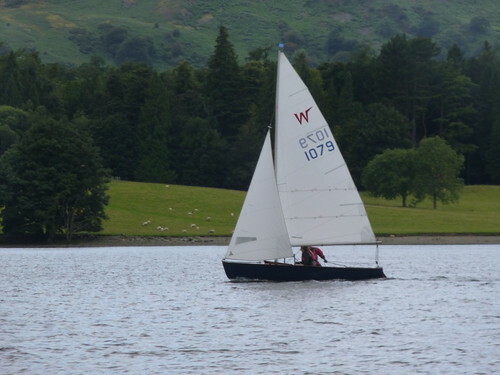 I’d planned the times carefully as well so we would have plenty of time before the last boat back from Pooley Bridge, you never know what might happen, and it’s always better to leave more time than necessary. There’s nothing worse than chasing public transport to ruin a walk! 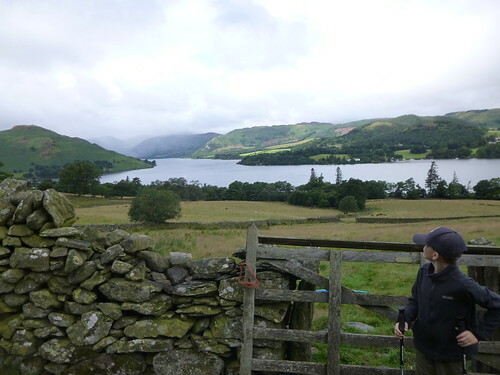 Once at the pier we set off straight away, the path rising steadily away from the lakeside. While it wasn’t steep the slope was unrelenting and we were plodding along at a relative snails pace, along with plenty of encouragement. The upside to this was plenty of opportunity to look back over the lake. It really is stunning. We had planned to take the upper route, mainly to take in the stone circle called “the Cockpit” at the top of the hill, again part of the Westmorland Way Pooley Bridge to Patterdale section we’d walked in reverse a couple of years earlier. 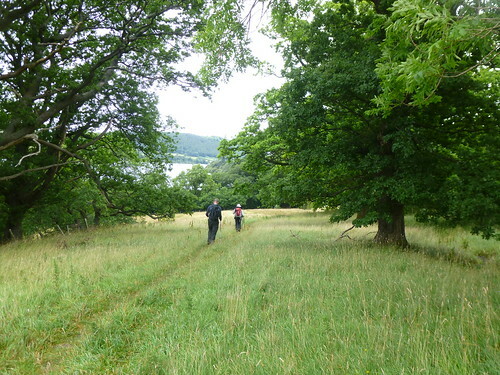 The track so far had been like a boundary marking the edge of the relatively pastoral fields below and the rough open fell above. Reaching the point where the path split we asked the question – he wasn’t keen on the upper route, and had we forced the issue, some consumer resistance might have come into play. 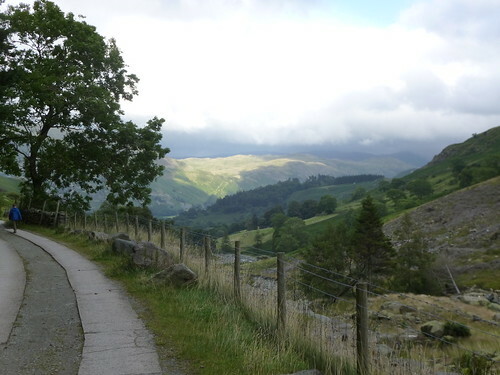 We took to the low route, and the character of the path changed completely. Having been on bridleway we were now walking through gentle fields, in many of which the grass had been left to grow long for winter feed. 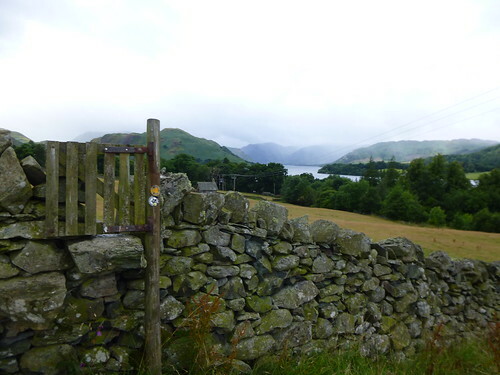 The only downside was the occasional booby trapped step stile over walls. The kind with the sprung gate that slams shut and tries to propel you off the top of the wall. Evil things! 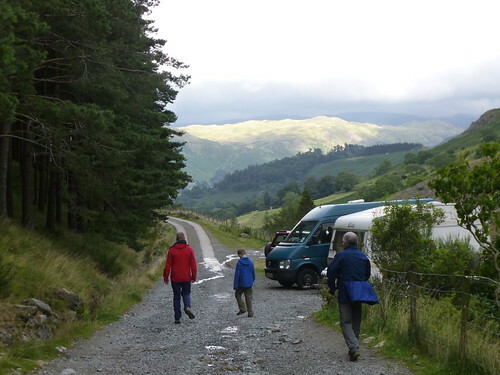 We were dropping back down towards the water side now and passed through a quite lovely campsite at Cross Dormont. It was on quite a slope though so I’m not sure I’d like to stay there in my backpacking tent – it could prove a bit awkward to sleep on the ground there! The path took to a minor single track road, remarkably busy with traffic, a steady stream heading back and forth. It just shows how popular this area is. The road didn’t last for very long and we entered a second campsite which hugged the waters edge. There were picnic benches here and we stopped a while to refuel. Meanwhile, the wind had picked up and rain started to fall. It wasn’t long before the cold set in, and to another chorus of complaints we set off again. 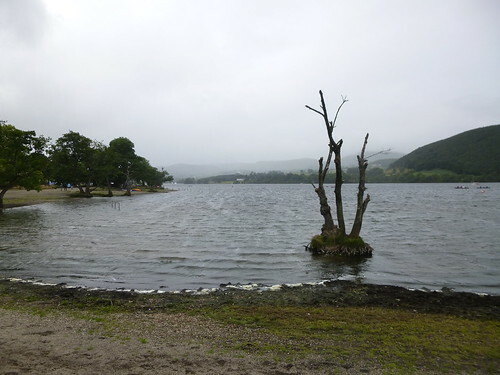 From here there was only a mile or so to go into Pooley Bridge, firstly through the campsite, busy with tents and camper vans, then along the stoney beaches of the Lakeside, busy with walkers and families walking back and forth from the campsite. We passed the slipway, so close but inaccessible over the water before a narrow little path deposited us virtually in the middle of the village. With a little time to spare we took a wander round the village before heading to the pub for a well earned…ahem…lemonade. From there it was a short walk to the pier to catch the boat back to Glenridding, giving a nice long rest before the walk back up the hill to the hostel. Although quite short, another lovely section of path with super views over the Lake. The only negative the short walk along the road. Taking the lower route brought a nice change in character from the previous day, with nice soft field walking, rather than the hard surface of the bridleway. Pooley Bridge is lovely, slightly busier than our previous visit before the floods, and there was a real buzz about the place.